You can try out the unique video slot Pharaoh’s Dream for free, without registration, right here. Pharaoh’s Dream is a slot made by Bally. This game is a must play for everyone who’s a fan of ancient Egypt. Are you ready to go on an adventure and get the Pharaoh’s hidden treasures? 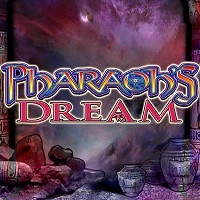 The Pharaoh’s Dream slot features images you would expect from a game based on ancient Egypt. The best paying symbol is the wild (the pyramids), which can also substitute any other symbols (except the scatter) to help you create winning combinations more easily. The Pharaoh’s Dream slot has other paying symbols too, like the Eye of Horus, the scarab, an ankh, and the usual card symbols. The Pharaoh’s Dream slot features a pretty great free spin bonus. To get into free spin mode, you have to roll 3 scatter symbols (a pharaoh’s head). They can appear on reels 1, 3 and 5 only. Once you’ve done it, you’ll be awarded with 10 free spins in addition to a 4x the total stake. the scatter and wild symbols are not available in free spin mode, so you cannot get bonus free spins. Instead, the free spin mode has a stacked wild feature. The stacks can appear on reels 2, 3, 4 and 5 only. Once a stack appears, it will be locked on the reel it appeared on until the free games feature is over. Unfortunately, the Pharaoh’s Dream slot does not offer any bonus games to players. You can play the Pharaoh’s Dream with real money too! The minimum bet is €0.50, while the maximum is €50. BGO – Play with real money at BGO for a chance to win the jackpot.